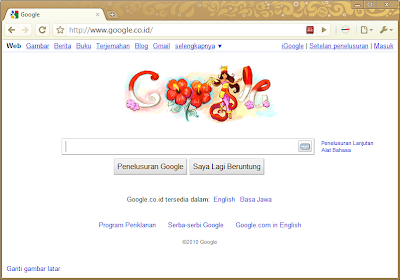 Today On August 17, 2010, Indonesia celebrate 65th Independence Day of Indonesia. Among academic and government also followed the Indonesian Independence Day ceremony. And competitions are also held as well as to enliven the Independence Day carnival. This has already become a habit Indonesian citizens in the celebration of Independence Day. Google as the most popular search engine right now who have welcomed the Indonesian Independence Day celebrations. Know if you visit the front page of Google Indonesia (www.google.co.id) and Google International (www.google.com).